You earned it, so why not enjoy it? 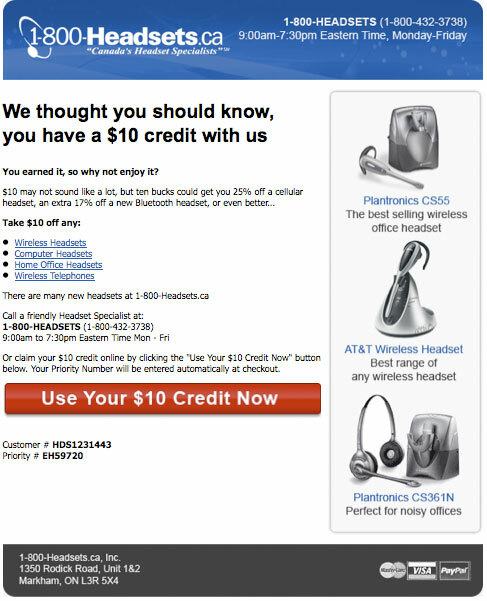 Or claim your $10 credit online by clicking the “Use Your $10 Credit Now” button below. Your Priority Number will be entered automatically at checkout. 3. Suggesting “ten bucks could get you 25% off a cellular headset” is smart. I purchased a computer headset. I’m more likely to be intrigued by a cellular headset than another computer one. It’s possible 1-800-Headsets segments customers by product category and customizes the message accordingly. 4. The credit is auto-applied by clicking the big (and I mean big) shiny red button. This makes it easy for the customer, no promo code to remember. It may also create urgency as to have the credit applied in the future would mean digging up the email and clicking through it again. 5. The products on the right hand side all have value propositions: best selling, best range and perfect for noisy offices. If you want to increase your click through for featured products, give the customer a good reason to be interested in them. An added bonus of the credit idea is you are not reducing the perceived value of your products by reducing the price. Rather, you are selling at full price (and full value) and giving the customer virtual dollars to spend. Sales are boring, and “come back and we’ll give you 10% off something” is overdone and not that exciting.